Crude prices are currently $45.46/bbl this morning, down .7% from yesterday’s closing price of $45.49. 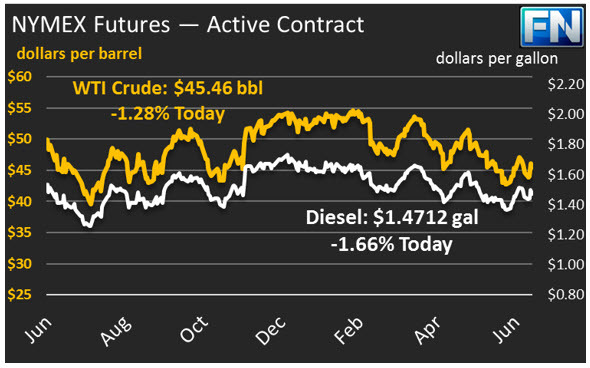 Prices reached a high yesterday of $46.48 following the EIA inventory report, followed by a less enthusiastic response to high production data and falling demand. 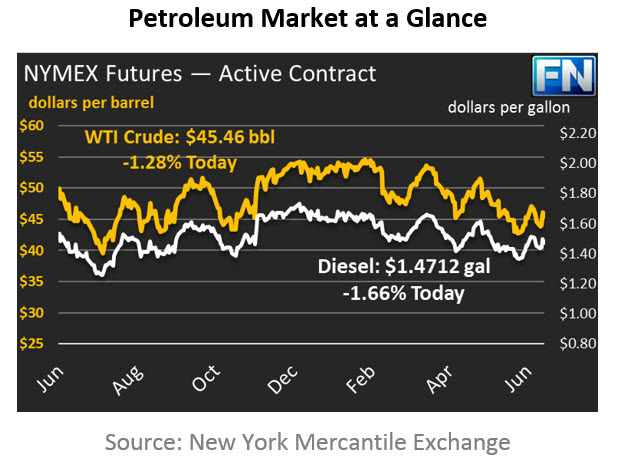 Prices opened this morning at $45.44/bbl, 30 cents lower than yesterday’s opening price. Diesel prices are $1.4712 this morning, down 25 points from yesterday’s close. Prices opened this morning at $1.4730, roughly 3 cents lower than yesterday’s opening price of $1.5053. Diesel prices are disproportionately lower this morning following reported distillate stock builds. Gasoline prices are $1.5149 this morning, down roughly 60 points from yesterday’s close of $1.5208. Prices opened this morning at $1.5162, below yesterday’s opening price of $1.5294. Prices rose higher yesterday following the EIA’s reported inventory data. Crude stockpiles fell by 7.6 MMbbls, despite the sales of over 3 MMbbls from the Strategic Petroleum Reserve (more on this in today’s second article). Gasoline stocks also fell by 1.6 MMbbls. Diesel stocks showed a 3.1 MMbbl stock build, likely driven in part by closing arbitrage opportunities with Latin America. Although prices bounced higher following the EIA’s reported crude stock draws, prices today are lower amid overall bearish fundamental news. The EIA reported yesterday that U.S. crude production has risen higher and that oil demand has fallen from last month’s record high levels. This morning, the IEA announced that OPEC production had risen 340 kbpd in June, driven by Saudi Arabia, Libyan, and Nigerian production, while OPEC compliance rates on their cuts had fallen to 78%. If this trend continues, it could spell trouble for the intended supply/demand rebalancing efforts.